Before you begin a decluttering effort in your home, it’s a great idea to create a simple plan. Start by taking a tour of your home, and try to view it as if you are coming in for the first time. Go slowly, looking high and low. Sit down in public areas. Where does clutter accumulate? What could use some cleaning, decluttering, organizing, or rearranging? Make notes about the things in your home you most want to attend to, along with what actions you plan to take. Then, assign a priority level of low, medium, or high. 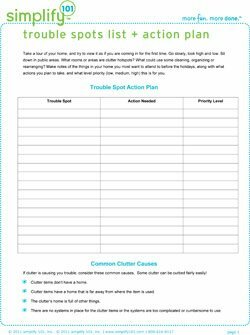 Capture this info on the trouble spots list + action plan printable. Then, get busy decluttering.